rugs, of materials considered worthless. 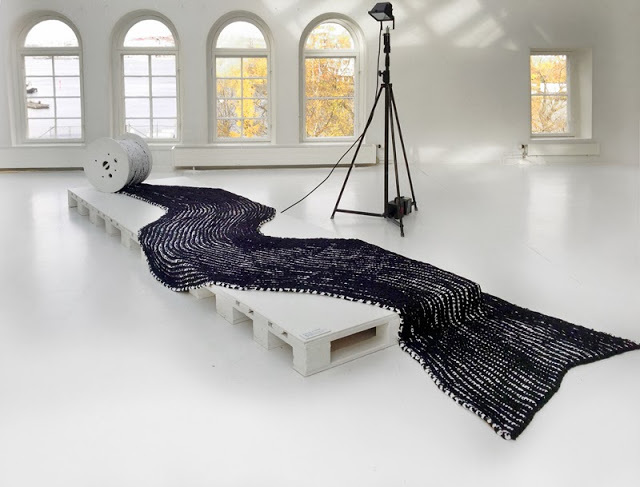 The exhibition Re Rag Rug is the result of our one year project of experimental design. In 12 months we created 12 unique rugs in 12 different techniques, without using a loom. 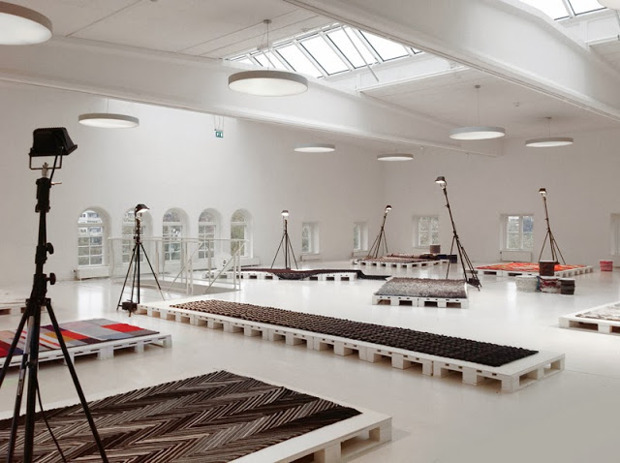 The rug CLOUDS during Stockholm Design Week at Åhléns City, Mästersamuelsgatan. The rug ARCHIPELAGO through Galerie Maria Wettergren at PAD Art Genvève. 1-4 February 2018. 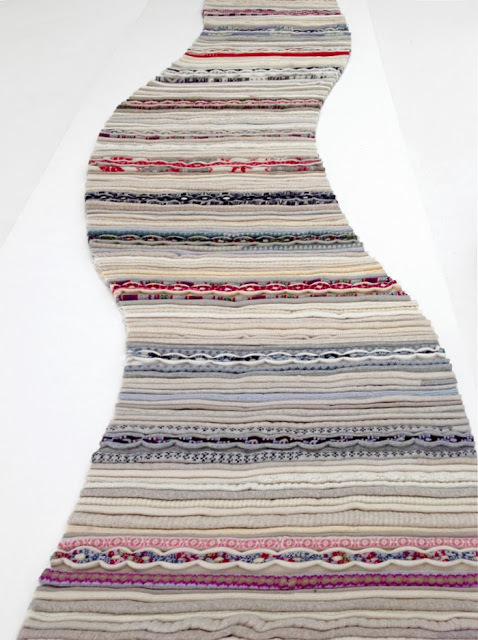 The rugs ROSENGÅNG and KASURI are part of the exhibition 'Handscape' at Atelier Muji, Tokyo. The rug OFF PIST at VIA, Paris. 21 September- 25 October 2017. 1. TAILOR has a pattern that is strong yet elegant, like an exclusive suit fabric. The stripes of felted discarded woolen sweaters are stitched diagonally to a base fabric. We have worked with shades and nuances to give lustre to the dull grey material. 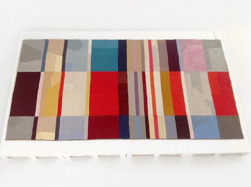 The rug is made in sections, lined separately, then stitched together. By mirror facing the different diagonals stripes the pattern can be varied in a number of ways. The sections could be produced as running meter, to cut and join into desired length and width. 4.ARCHIPELAG resembles a map with greens lands, sand and deep sea but is built on a cross-stitch embroidery with a hounds tooth design. The technique is enlarged and extended cross-stitch embroidery. Many kilos of coloured T-shirts gave us a rich palatte to ‘paint’ with and create unique shades and colour combinations. The result is a changeable surface with depth and slightly billowy. It does not give solid ground and we want to make it flows further and grow to twice the size. 7. 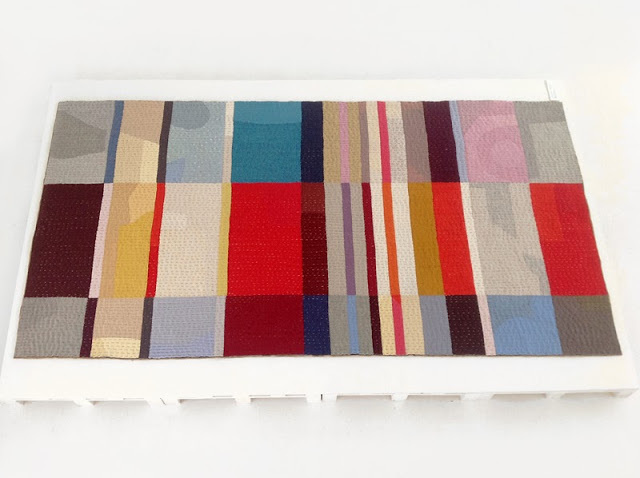 AQUARELLE is composed with color blocks of parallel checks and stripes. Each block is a patchwork of irregular pieces of woolen sweaters in the same color tone. The different tones create a texture of light meeting shadow or wet meeting dry. 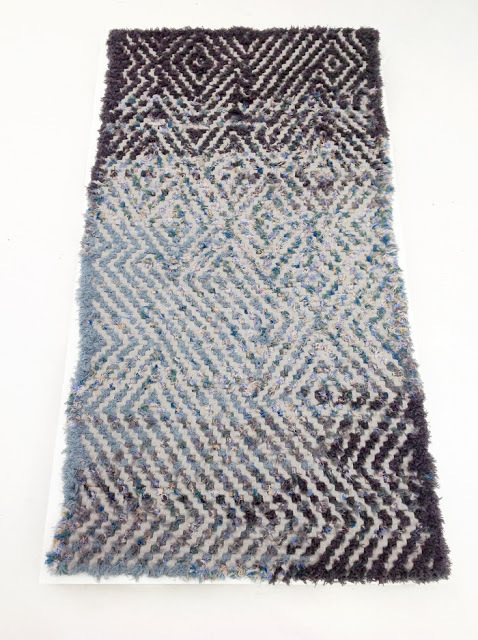 The rug is constructed by layers of woolen sweaters where the base layers are reinforces by machine stitching. The decorative top layer is stitched with a running stitch - the simplest of stitches- commonly used to patch, join and decorate with. We have seen it as ‘Kantha’ on our travels to India, Pakistan and Bangladesh and as ‘Sashiko’ in Japan. 10. SQUEEZE knitted with a yersey yarn in a two-colored double knit. 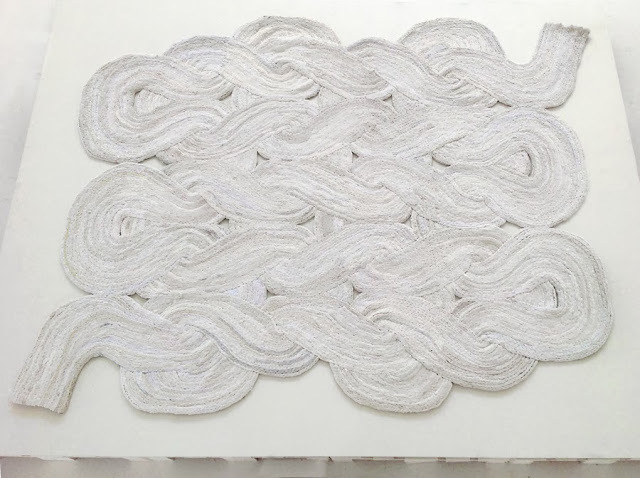 It is one of the most elastic knits we know, just the opposite of a good quality for a rug. The quality is so elastic that it flows, also due to it's weight. It becomes alive. It is two-sided with black dominating one side and white the other. As the stripes in the knit expand the white shines through and when contracted the black becomes more dense. 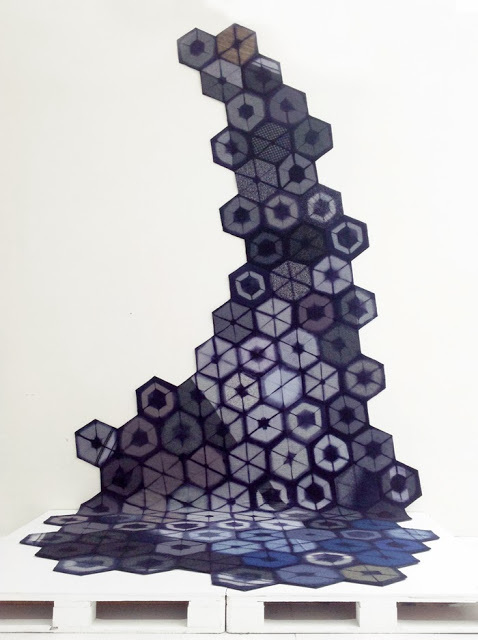 To ’sweep things under the rug’ is tempting as the optical effect enhances the shapes it covers. Is it a rug or not? Squeeze is hand knitted in India out of excess from the T-shirt industry. 2. KASURI reminds us of the Japanese textile Kasuri, which is ikat-dyed and woven technique. Braiding of rags into rugs is well known but we wanted to find a new expression for the technique. We discovered that the braids created different patterns if placed alongside each other. We created a series of patterns by varying the colours and widths of the braids. This way of working with colours, composition and qualities can be developed into many new designs. The rug is made of discarded T-shirts. 5. MILKY WAY is the result of a meeting between two textile traditions with two very differing expressions. It is also the meeting between dark and light, diamonds and junk. We wanted to work with the hexagonal shape but not in the traditionall way used in patchwork quilts. The hexagon is also common in Japanese Shibori dyeing. 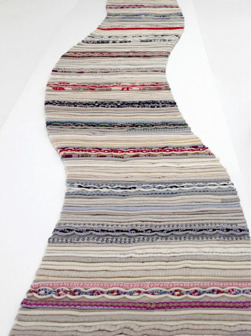 The rug is made of discarded woolen sweaters constructed with layers. The design is made by folding the hexagons into three and are then shibori-dyed in a dark indigo shade. In the composition we wanted to create sparkles and high lights to add lustre to the material. 8. OFF PIST looks soft and pliable, like a snow landscape, but every bend offered tough resistance. Most knitted techniques give a flexible textile. We wanted our rug to have the expression with the elasticity of a knit but with the sturdiness of a rug. Off Pist is embroidered with T-shirts rags. A T-shirt is stitched of a jersey fabric which is a knitted material. A knitted stitch is a loop that looks like a chain stitch, a decorative embroidery technique that is used around the world. Off Pist therefore has the motif of knitted stitches, with an embroidery stitch that looks like a knitted stitch, of a knitted material. 11. NOMAD is natural, like a skin rug. We were donated a large box of woolen selvedges from Klippans Yllefabrik in Latvia and were struggeling with solving the task during a year. The colours were hard to combine and this is a the challenge when working with waste materials – it is impossible to order preferred colours. Finally we spun the selvedges into a rya yarn using a crochet needle on a drill. Using a contrasting flat fabric with the rya yarn achieved an interesting structure. The fabric is cut and the yarn could woven into the fabric. 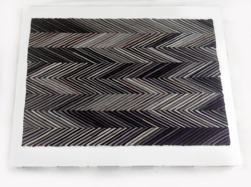 The pattern is a combination of the weaving techniques goose eye- twill- and herringbone weaves. 3. PEPITA looks yummy. Like chocolate, nougat, butter scotch, sugar cubes and coffee with and without milk. 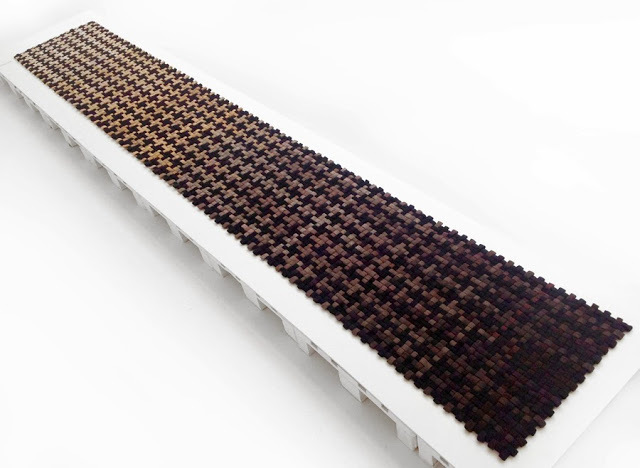 The very long rug is toned in colours that difuse the pattern and enhance the perspective of length. 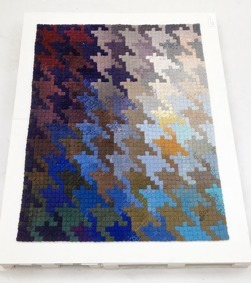 The technique where warp meets weft in the simplest of weaves, the plain weave, but the colour effect creates a hounds tooth design. The material is felted woolen sweaters. The material is cut into stripes, stitched double to make it heavy but still soft. The edges of the rug brings to mind basketry work. 6. ROSENGÅNG associates to a well used, woven, traditional Swedish rag rug. It has stripes of decorative patterned borders (in Swe. Rose path) and from a distance looks like a woven rag rug. It is made from thick felted woolen sweaters and has heavy structure. The feeling however is soft and the rugs appearance is light. When stepped upon the feet sink into the texture and it is gives a feeling of walking on moss. It is tempting to follow the curves of the path. Despite the curves Rosengång stil has calmness about it as the stripes are horizontal. 9. RE ORIENT is crocheted. A technique that awakens nostalgia of textile memories, depending on where and when you grew up. In Sweden crochet has been regarded as ugly and with less value than other handicraft techniques. Our goal was to find a new expression for such a genius and simple technique, all you need is a crochet needle. It also offers great freedom to create free and playful patterns. The material is discarded T-shirts and we chose a rich colour scheme and the design is inspired by the oriental rug as well as the Röllakan and the granny square. 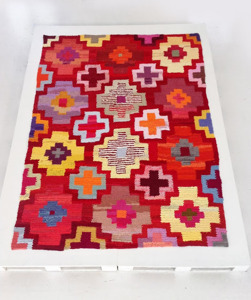 ‘Re Orient’ marries the highly valued oriental rug with the underrated crochet. 12. CONFETTI could be our largest rug made of the tiniest pieces. The grey triangles of cutting waste from our first rug, 'Tailor', inspired us to make a wall-to-wall carpet. 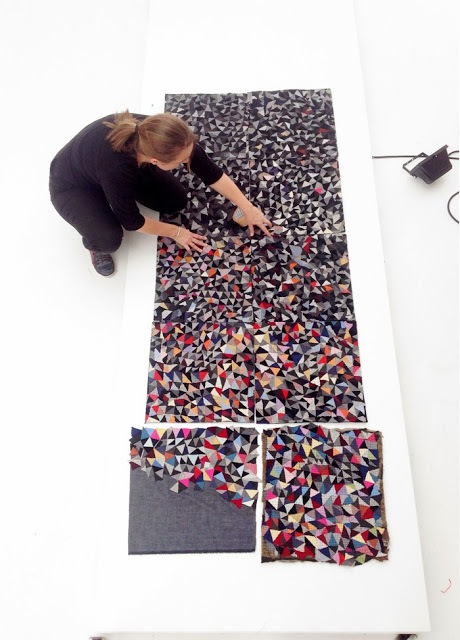 Layers of woolen sweaters, have been covered by the triangles, adding more colour as we go along. The machine stitching re-inforces the structure and each square becomes very sturdy and thick. 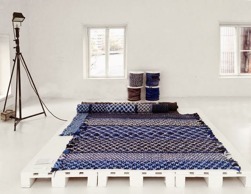 The squares can be combined in multiple ways as a wall-to-wall carpet. With the colour added the design looks like stone- and marble floors, colourful bunting or confett, celebrating the end of the 12 month project!